This week's Blitz of the Week is a variation of the NCAA blitz. The Mike and Sam switch rolls from their normal NCAA blitz responsibilities. The Mike goes 1st and is off the edge. 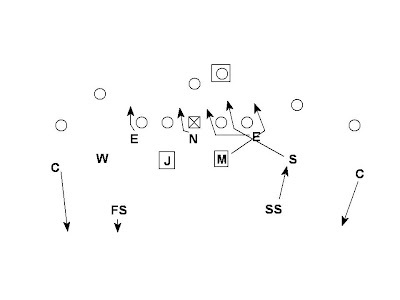 The Sam is 2nd and is blitzing the gap between the long sticking end and the edge blitzer. The Sam is a spill player. This blitz can be difficult to pick up because protectors often have difficulty seeing a player that is aligned outside coming on an inside rush. 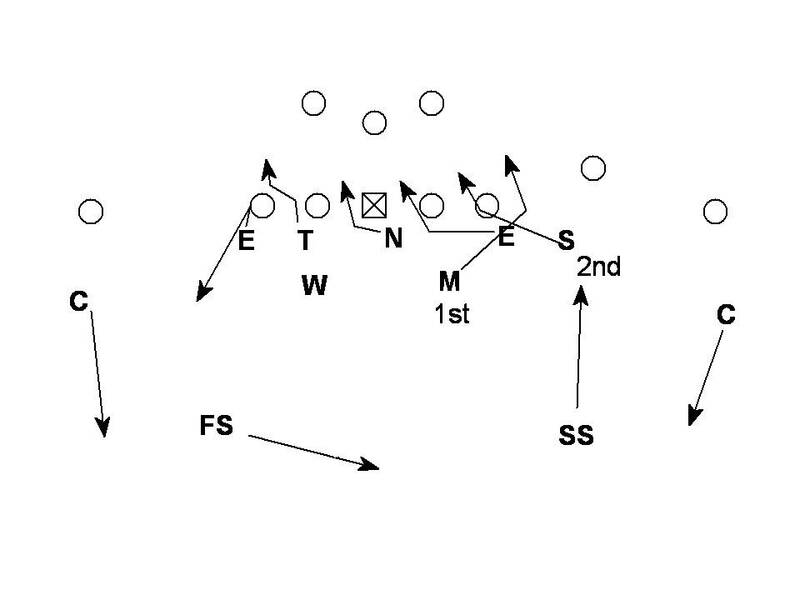 The same pressure from a 3-4 look can create confusion for the BOB pass pro utilized by AirRaid teams discussed in the post Air Raid Strip Down on Brophy's Blog. 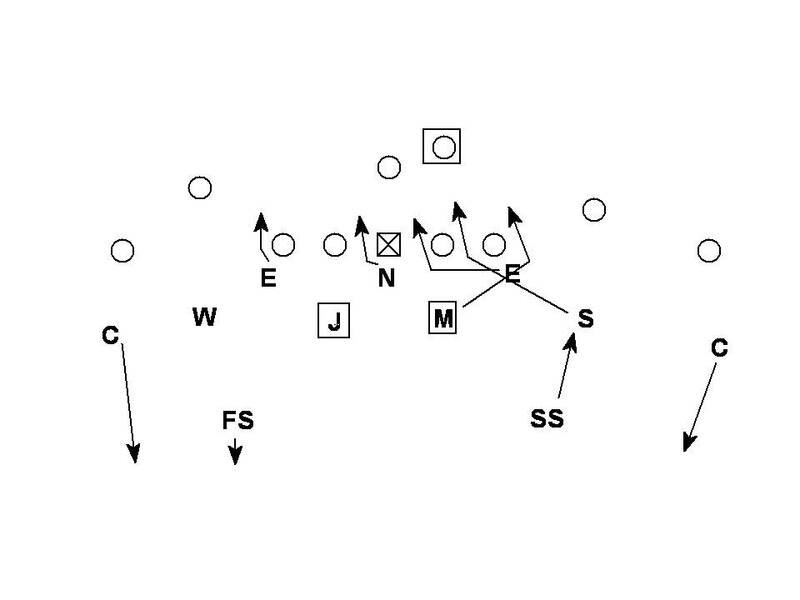 The RB has both ILB's and is thinking he will need to block the Mike that is blitzing outside. The OT is thinking he is blocking the edge rush when the DE goes inside. The edge rusher happens to be the responsibility of the RB. 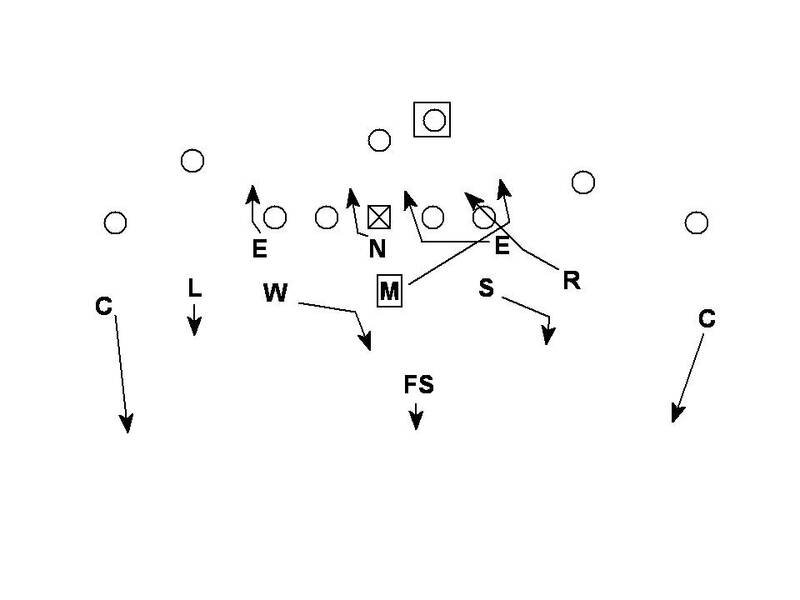 The OT and RB either must exchange responsibilities or the OT must react to the inside blitzer and block the Sam. While the offense has enough protectors to block this pressure the change up in responsibility forces the offense to rep this blitz and make the right decision to get it picked up in game. 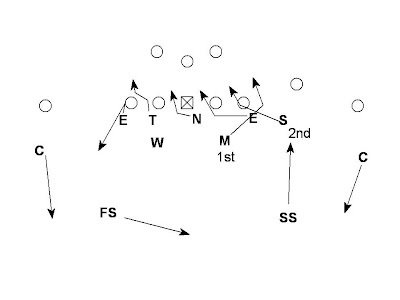 Similar confusion can be created against this protection from the 3-3 stack. The Baltimore Ravens can be seen here executing this type of blitz in 2008 from a 3-4 with man coverage behind it. A good video of the Ravens running the traditional NCAA blitz is available here.